We live in a world where job productivity and words per minute while typing on a keyboard go hand in hand. Simply spending some extra time writing up notes on a computer can help increase this skill, but why would anyone do that when games like Typing of the Dead exist? I recently had the chance to demo a title that borrows that same idea of typing words and phrases to attack enemies. 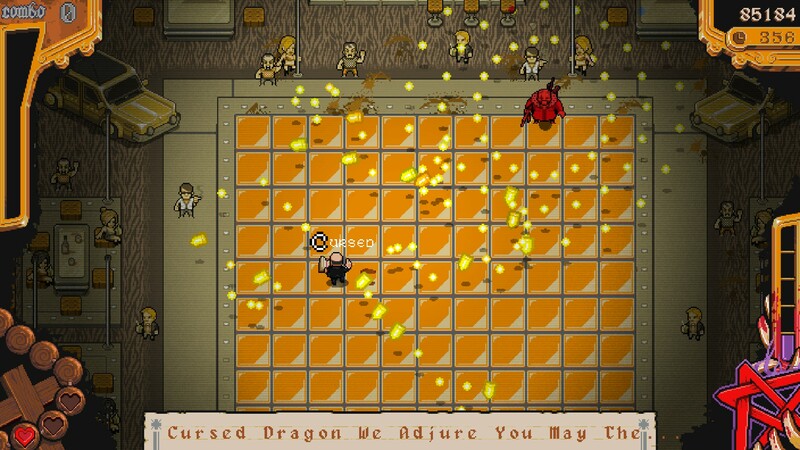 The Textorcist: The Story of Ray Bibbia can best be summarized as a bullet-hell style shooter where players type religious passages and related phrases to exorcise demons and other unsavory characters. It also mixes in some elements found in adventure games. Keeping in mind that I’ve only played the demo, let’s discuss some of my key takeaways. The story of The Textorcist revolves around a disgruntled former priest named Ray Bibbia. Let me just say that this man does not have time to waste on everyday street thugs. During the first few minutes of gameplay, a thief attempts to rob him at knifepoint. How does Ray choose to handle this? He uses a series of incantations to make the man explode from the inside out. He then follows this deed up with a cheeky remark and goes about his evening. As the demo continues to unfold, Ray performs a by the book exorcism and discovers that the church with which he used to associate may be turning a blind eye to a local slave trade. Despite being a bit of a questionable person himself, Ray won’t stand for this and sets off to learn more about this issue. I feel that it’s best to address the most standout point of this game first- the gameplay. As mentioned above, this is a bullet-hell shooter that involves a great deal of typing. During fight (exorcism) sequences, you control Ray’s movements with your right hand using the arrow keys. That’s easier said than done though since you will also need to have your right hand available to type the text that appears on screen. Essentially, you’ll need to begin typing as fast as possible (while avoiding mistakes) and then pause to dodge enemy fire as it heads towards you. If it weren’t for the penalties associated with typing the wrong letters, simply typing and dodging is something that you can get used to after a while. However, whenever you type a letter incorrectly, you lose a bit of health and are required to type the preceding letter again as well. There’s also the added challenge of carrying around your spell book, which allows you to actually turn your words into projectiles. Whenever you take damage from enemy fire, you will first lose this spell book before taking damage. When you do inevitably lose it, you will need to chase it down as it flies to a random part of the screen. There is a timer wheel which displays above the book during all of this. If you manage to pick it up again before the wheel goes away, you can resume your incantation from the last letter that you typed. Picking it up after the wheel is gone means having to start the current passage all over again. As you can see, the developers put a great deal of thought into this, and that detail did not go unnoticed. 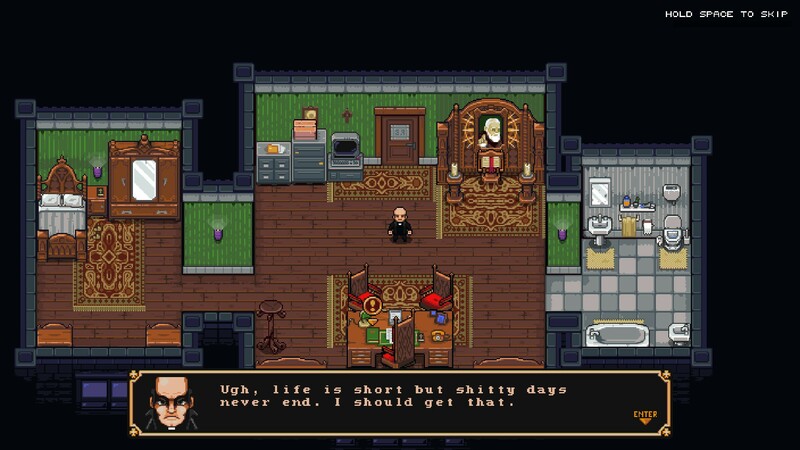 Fighting mechanics aside, there are also periods of The Textorcist that feel more like an adventure game. Within Ray’s house, you can interact with almost any object by typing the prompted text displayed in front of it. You can also head to other locations within the game using some sort of futuristic transporter system that Ray has in his possession. While the demo doesn’t feature much of this adventure-oriented gameplay, the pieces that are there are pretty enjoyable and feature some really great dialogue from both Ray and the characters that he meets with. There are a number of great jokes sprinkled throughout as well. When accessing Ray’s computer, you’re required to interact with it using actual DOS commands, though he refers to the system as MS-DEUS. From there you can search on GODLE using any keyword that your heart desires. The game will generate a number of generic search results that substitute certain words with your keyword. I appreciated all of these details and hope to see even more of them in the official release. The art style is exactly what you’d expect of a 16/32-bit styled title. Everything looks crisp and there are a nice variety of colors in each location as well. The developers went for a rather dark, almost evil vibe for a lot of the locations, and that makes sense given the context of the story. Even the patterns formed by enemy projectiles were neat to look at. While I only had the chance to see the first few fights, official screenshots provided by the developer indicate that this remains true for the others as well, if not more so. There were only a few music tracks present in the demo, but the ones that were there were quite enjoyable. For the most part, the soundtrack is comprised of tracks that make heavy use of both synth and bass. This is no surprise though as the soundtrack was created by the synthwave artist GosT. I actually had the chance to see him live in Chicago a few years back, and can vouch that he does some amazing work. The tracks that he’s created for The Textorcist are all very upbeat and all very dark. I feel like they would be right at home in a nightclub. They also pair really well with the fast-paced gameplay during boss fights. There are some less brisk songs mixed in too, like the one that plays while you’re inside Ray’s house. This track gave me a bit of a Luigi’s Mansion vibe if you can believe that. I can’t wait to hear what other tracks will be included with the full game. I wish that I had some better suggestions for the developers, but honestly I’d just recommend that they keep expanding on what they’ve presented so far. The demo itself was very short, totaling in at just over an hour of overall playtime. Having said that, I feel that an hour was more than enough time for me to form an initial opinion of this game. Its unique usage of typing during boss fights was done exceptionally well and each victory felt like it was something that I had earned. It’s a good thing the developers didn’t seem to encourage religion with this title, as I found myself cursing god more than ever during the fights. The full version of The Textorcist: The Story of Ray Bibbia will be available on Steam starting February 14, 2019. It was developed by Morbidware and is being published by Headup Games. If the quality of this demo is any indication of the final product, then I’m already sold. A demo copy was provided by the publisher for review purposes.